You should consult your physician or other health care professional before starting any new diet or fitness program to determine if it is right for your needs. My current binge of diet/health research was inspired by Kasma’s diagnosis of diabetes. In the links below, I’ll include the articles that she used (and continues to use) as a basis for her treatment. My research has taken me into some places somewhat different than her protocol, however more in degree than substance. We both started from a base diet of nutrient-dense foods including lots of saturated fats and fermented foods, basically what the Weston A. Price Foundation (WAPF) advocates but without the grains, fruits and sweeteners. In reading about health issues for prevention and cure of diabetes I’ve come across a lot of research about LCHF – Low Carbohydrate High Fat – diets. Looking at evolution and biochemistry, I think there’s a fairly strong case that we humans are just not suited to eating large amounts of carbohydrates and that the optimal diet for many of us is LCHF. One issue that is important has to do with saturated fat. Saturated fat is a good, healthy fat. I’ve been comfortable with this fact for many years but I’ll include some links about this at the end if you still have any doubts. There was never any evidence against saturated fat – when the recommendations were instituted there was nothing to back them and there still isn’t. A low carb diet simply won’t work without enough fat: you’ll be too hungry. 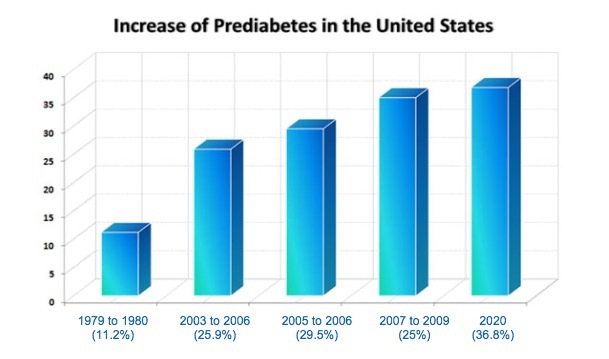 The obesity curve in the U.S. is pretty interesting. 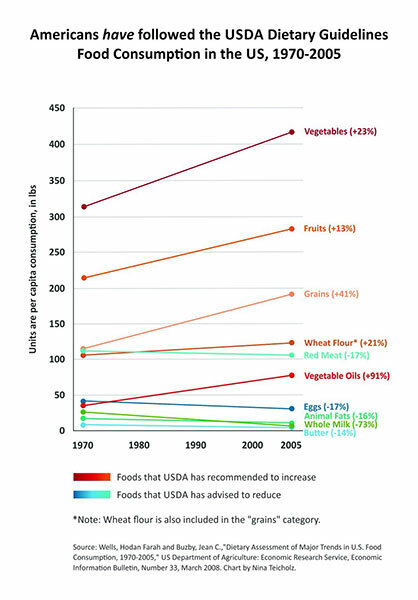 Starting around 1980, 3 years after the first USDA grain-heavy food pyramid was first published, the rate of obesity and diabetes began to drastically rise. 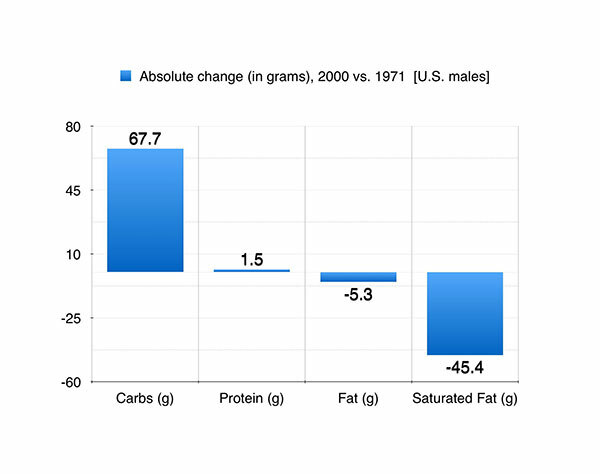 During that time as a nation our grain consumption went up, our sugar (and particularly high fructose corn syrup) consumption went up, our saturated fat (including butter) went down, our meat consumption went down and our vegetable oil consumption went up. One of the criticisms of the LCHF diet is that there is no evidence that it is effective. (Though there have been at least 54 studies comparing some version of the LCHF diet with others; I’ll put a link below.) 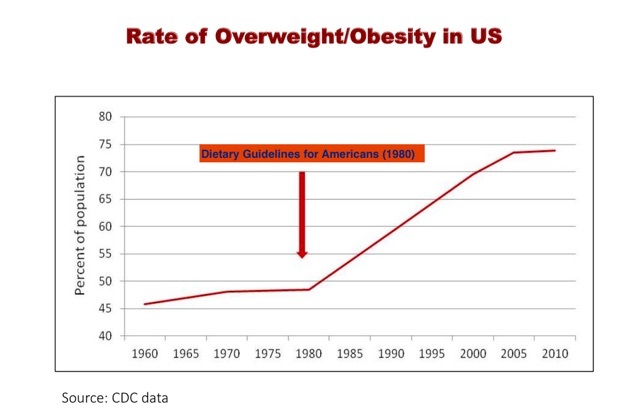 It seems to me that even though we can’t prove causation, that we have pretty good evidence about the efficacy of the diet the health professionals tend to recommend: just look at what’s happened in the U.S. since 1977! The conventional recommended diet simply is making us collectively unhealthier. I’ve also gotten interested in intermittent fasting. We almost certainly did not evolve eating 3 meals a day or eating a ton of carbohydrates. We evolved with times of feast and famine and in the times of famine we needed to be able to function effectively both physically and cognitively or we wouldn’t have survived. Fasting some of the time may well be the way our bodies evolved. When we eat carbohydrates, complex or not, the non-fiber component turns into glucose in our body and the glucose stimulates insulin production. When we have insulin in the system, we store fat, we don’t burn it. There are other biological pathways that link excess insulin (and “insulin resistance”) to all kinds of diseases from cancer to Alzheimer’s and there are viable explanations of the biological pathways that are likely responsible. The less carbohydrates in our diet, the less glucose in the blood and the less insulin around to store fat and cause other undesirable biological effects. Once we start burning fat we produce ketones to use as energy rather than glucose. It turns out that ketones are a more efficient fuel for our cells and have a large number of healing and efficiency benefits. (See links below.) If necessary, our body will make any glucose that it needs to function. The connection of excess insulin and insulin resistance (which I’ll leave to the linked articles explain) to basic disease processes is a reason I feel it’s important to consider a diet that mitigates the damage insulin can do. Unless we address the disease process at the basic cell level, where it all begins, anything else we do – medication, vitamin supplements, and on and on – will not really be 100% effective. Addressing the metabolic level and what insulin does at that level is addressing the cause; anything else is just symptom removal. For instance, conventional medicine treats diabetes mainly by attempting to lower blood glucose levels by medication or the use of insulin shots. (I’m discounting their attempts to treat by diet because I think the amount of carbs they recommend for a diabetic – 135 to 160 grams per day – makes the condition worse.) I’m including links to two different meta-analysis of the studies available that conclude that lowering glucose through medication or by using insulin has no effect on mortality and no effect on the horrible complications of diabetes, including blindness, neuropathy and kidney failure. That’s what happens when you just treat the symptoms. Everyone is different. Everyone has to find what works for them. Reading the Internet there are tons of people who swear by LCHF. There are tons of people who say they tried it and it didn’t work. There are lots of other things out there that people say worked. Well, in looking for something that might work for me, I came up with the LCHF diet. This is not medical advice: it’s just what I’ve discovered and what seems to be working for myself and Kasma. Doctors I know who make this information available to their patients tell me that most patients don’t want to be bothered with changing their diet or making the commitment a changed diet involves. For me, it took being sick enough: I’ll try anything and commit to it for a time to see if it helps. LCHF improved my health and well-being enough that it provides its own motivation (reinforcement) to continue. I found I needed to make a time commitment. The article that got Kasma started talked about giving it 6 months – it can take that long to take full effect. I had bad days, particularly at the start while going through a period of adaptation, and the time commitment helped me to get through those. With the idiot diet advice we’ve gotten for decades and the bombardment of advertisements for “foods” that do not nourish us, it’s easy to find an excuse or a reason to cheat. It can be difficult when friends don’t understand your diet, it may be harder to share meals socially. I was highly motivated because I’ve suffered from various complaints for many years and they seemed to be getting worse. I had to focus on how much I wanted to be healthy, now, in 5 years, and when I’m 80. The time commitment and a commitment to keep the commitment (a meta-commitment?) definitely helped. You don’t have to do it all at once. Just giving up processed foods and sugar is a great start. Sugar is addictive: it’s hard to just taper off. Both Kasma and I found that after a few days of going cold turkey that sweet things no longer appealed to us. It helps to consider some of the information about what sugar does to you (see links below). I think lack of will-power is blamed for too much. When I was very tired and had no energy, the only way I would walk in the morning was through forcing myself to do it (although at that point, I just got more tired). Now that I have more energy, most mornings I want to walk: it wasn’t laziness or lack of will-power, it was metabolism. The same with sweet things. It’s not will-power to not eat them now, they just no longer have an attraction. My metabolism has changed and no longer drives the cravings. Sure I’ve cheated and not followed the diet 100%. It happens. As much as I’m able, I don’t beat myself up for it. I just start it up again. I find that if I don’t eat enough good fat, I have a harder time keeping the carbs down. It really has to be a High Fat diet along with the Low Carbohydrates. There is a lot of variation in what constitutes a LCHF diet. The main point is to restrict carbohydrates. Kasma started with a recommendation to limit carbs to 60 to 75 grams a day. I estimate she now gets 40 to 50 grams. I average less than 25 grams. If it all sounds too daunting, the simple advice is just cut the carbohydrates and replace them with good, saturated fat. I found that reading widely about LCHF diets and finding the one that worked for me was helpful. It provided a framework and finding how many other people are doing it successfully gave me confidence. I’m excited that here is a path to health that has worked and continues to works for many, many people and is firmly based in the biochemistry of the body and not some study I read about in the papers. At the minimum it gives me a something to try in a quest to feel better and to age gracefully. That’s enough of my opinions. The rest of this will be links to articles that I found useful and convincing. I’ll include some podcasts with the researchers who are uncovering this exciting information and are great listening. 0: Basic diet: If you just read one thing . . . . (well, two things) . . . The Weston A. Price Foundation (WAPF) was founded to promote traditional diets, the basic nutrient-rich diets that were followed by cultures prior to the arrival of processed foods. Here are the basic WAPF dietary recommendations. Even if you don’t go LCHF, these are great recommendations for a good diet. We’ve made just a few modifications: no grains, no fruits and no sweeteners whatsoever. Here’s an introduction to why LCHF is healthy eating along with some of the basics without being wholly focused on diabetes. It lacks some of the important aspects of the WAPF diet such as fermented foods. The author, Ted Naiman is an M.D. in Seattle who treats his patients with LCHF. Imagine such a thing! Any of the other links (in a grey line) at the top of the page are worth reading as well. For more reading about the WAPF philosophy and teachings, start here. 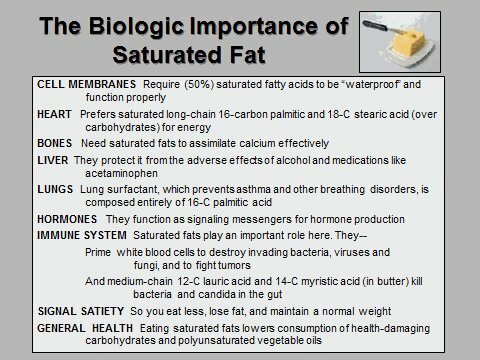 And if you have any thoughts at all that saturated fat is not healthy or are afraid to eat too much of them, go to section 7 below: Corrective Information on Saturated Fat & Cholesterol. These two articles were Kasma’s main inspiration and starting point. As long-time followers of the work of the Weston A. Price Foundation, it was natural for Kasma to start with an article by Dr. Tom Cowan on their website. That article (the first below), which also goes into insulin resistance and some of the causes of diabetes, is Kasma’s main blueprint for healing. It recommends a maximum 60 to 75 grams of carbohydrates a day, much, much less than the roughly 260to 300 grams per day averaged in the U.S. or he 135 to 180 (45 to 60 grams per meal) recommended by the American Diabetic Association. (I estimate that Kasma probably gets around 40 to 50 grams of carbohydrates a day at this point.) Kasma has followed his advice on supplementation for the entire time as well. Using this protocol, and adding walking after breakfast and dinner (about 11,000 steps a day), Kasma’s original resting glucose of 260 went to 110 in 6 months. And her HA1c went from 13 to 6.3. Both figure are very close to what is considered “normal” and she is no longer diagnosed as diabetic (just “pre-diabetic). Kasma feels that cod liver oil has been an essential part of her healing. This appeared on September 10 in the NY Times. Noakes: do doctors, dietitians make diabetes a threat to life? “Indeed I argue that the very reason we are facing an uncontrollable global diabetes/obesity pandemic at the moment, is because we have promoted dietary guidelines that are based solely on “evidence” from associational studies without acknowledging that RCTs have either not supported those conclusions or might have actively disproved them. Here’s a meta-analysis of available studies that look at the effect of using exogenous insulin (such as shots) to control your blood glucose. It concludes: “There is no significant evidence of long term efficacy of insulin on any clinical outcome in T2D." The metabolic theory of cancer is an alternative to the genetic model that currently drives research and treatment. It looks at the fact that cancer cells thrive and multiply when glucose is available. The basic idea is: limit the glucose, the cancer cells will starve. The 4-part series below has good information about cancer as a metabolic disease. It’s a good introduction and at the end she includes links to two books in case you want to explore further. Alzheimer’s disease is beginning to be called Type 3 Diabetes because of the connection with insulin. These three videos by Dr. Robert Lustig, an endocrinologist at the University of California are recommended. There’s a reason that sugar has escaped the condemnation it deserves for it’s role in producing ill health. This article explains why and also shines light on why most of us were so afraid of saturated fat for so many years. Although there are many benefits from just a LCHF diet, there appear to be many more from going ketogenic. I have tried to go ketogenic because I have 3 auto-immune disorders and feel that it will help my healing more. For me it made sense to start out with LCHF and as I read more, the ketogenic seemed like it might help more so I’m giving it a try. At the start, it has taken a lot of attention and effort. Many of the people who swear by the ketogenic diet are endurance athletes or weightlifters. These articles will go into why a ketonic diet is such a good idea. The first article can get a bit technical, but it’s an excellent explanation of why a ketogenic diet is so healthy. This is a good basic introduction to the whole ketogenic smorgasbord. As a plus it features Dominic D’Agostino, a researcher at University of Southern Florida. I’ll include another link here. It’s a link to a series of podcasts with Jimmy Moore, who has been following a ketogenic diet since 2004 (and went from 410 to 180 pounds) and Dr. Adam Nally, an osteopathic physician, who has treated thousands of patients with a ketogenic diet. The podcasts can get a little hokey – they like to kid around – but I’ve found them extremely valuable. They provide a lot of very practical information. Every week they answer questions from people and I always find something useful. It is invaluable to have questions answered by someone with such wide clinical experience of what he is talking about and gives a good sense that if you want to go ketogenic, it’s going to take some analysis and work. Many doctors consider this a dangerous diet and it’s useful to me to have someone who’s treated so many patients with it give another point of view. I’m excited about doing some intermittent fasting: there are very many good things that happen to your metabolism when you fast. (I've included a graphic at the end of the article.) 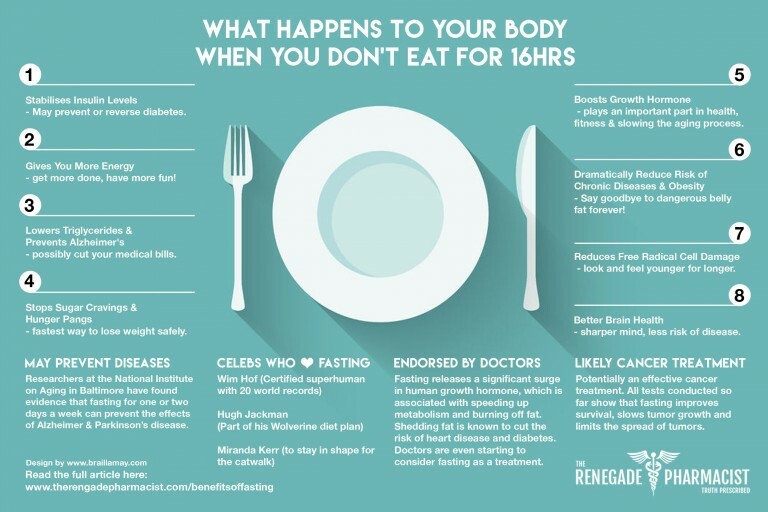 It appears that we evolved fasting and that our bodies very efficiently knew how to keep us in a state of enhanced energy and cognition when we did so: if that was not the case, we would not have been able to find food and survive. The basic idea is that overtime you eat, you stimulate insulin. If you eat many small meals, insulin will always be in your blood telling you to store, not burn, fat. Fasting, even for 12 or 14 hours, gives the whole system a break. I started by fasting between meals. Mostly now I usually skip breakfast, so I go roughly 16 or 17 hours from dinner to lunch the next day without food and eat just two meals a day. I’ll soon try a an occasional 23 to 24 hour fast (dinner to dinner) and (hopefully) work up to a 3 or 4 day fast. It really does appear that a lot of healing goes on when your body doesn’t have to spend so much time digesting food and dealing with insulin. It is taking some time to get comfortable doing this. We may have evolved to be comfortable without food, but after a lifetime of 3 to 5 meals a day plus snacks, my body didn’t know how to burn fat for energy anymore. First attempts led to fatigue and massive hunger. Slowly it is starting to be more comfortable. There seem to be enough benefits to see this through. It can be pretty simple too: stop snacking, fast between meals; miss a meal once or twice a week. Even a little bit probably has a positive effect. These Frequently Asked Questions are by Dr. Jason Fung, perhaps the foremost exponent of intermittent fasting. Consider listening to some of these talks. Very interesting talks by very smart people. The first 3 were podcasts that I obtained from the iTunes store. Mattson is a neuroscience professor at John Hopkins University and goes into the benefits of fasting and the physiological mechanisms behind the benefits. This is a brilliant exposition of cancer as a metabolic (not genetic) disorder by Thomas Seyfried, a Professor of Biology at Boston College. The Quantified Body has some other interesting podcasts as well. I think of Dr. Jason Fung as the intermittent fasting guru. Any of his talks are valuable.